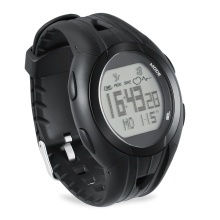 This heart rate monitor & watch is a perfect addition to your training program such as running, cycling, skiing, etc. Wears the watch on your wrist as a fitness tracker watch; fixed on the bike to use as a bike computer. Monitors heart rate with the stretchable chest strap that perfectly adapts to your body shape. Tracks current/maximum/average speed, exercise time, distance, steps, calories. Other functions: timer, clock, calendar, hourly chime, water-resistant, EL backlight. Durable ABS material shell, soft PU watch band, stainless steel buckle, replaceable CR2032 batteries. 4 colors available for you to choose: Oval Black and Pink are for women; Round Black and Blue are for men.